Lake Havasu City is a city in Mohave County in western Arizona. It is known best for being the home of the 1831 London Bridge, which Robert McCulloch, the founder of the city, bought from the British government in 1967. Lake Havasu City is very far from any major airport. Your best bet would probably be Las Vegas McCarran International Airport (LAS IATA). Lake Havasu City is on Arizona State Route 95, which is accessed via Exit 9 off Interstate 40, about 10 miles (16 km) east of the California border and 42 miles (67 km) west of Kingman. 34.471696-114.3407791 Greyhound, 116 S Lake Havasu Ave #202, ☎ +1 928-854-5253, toll-free: +1 800-231-2222. M-Sa 9AM-5PM (station and ticketing). Amtrak, Needles. Needles, California, on I-40 about 20 miles west of Exit 9, is the closest city with an Amtrak station. It is served by the Southwest Chief Chicago - Los Angeles route. Arizona State Route 95 is the city's main (and only) artery. There are some great sunsets to see in this area in the summer as the sun goes down over the surrounding hills. There are many places to do watersports on the lake with this a popular destination for boating holidays. There is also a golf range near one of the hotels. 34.47159-114.347511 London Bridge, McCulloch Blvd over the Bridgewater Channel Canal. 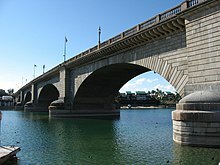 Built in 1831 over the River Thames in London (replacing an earlier bridge from the 13th century), the bridge was dismantled in 1967 and shipped in pieces to Lake Havasu City, where it was carefully reconstructed. There are several restaurants if the London Bridge is crossed onto the island. 34.468663-114.3410261 Mudshark Brewery, 210 Swanson Ave, ☎ +1 928-453-2981. Noted for craft beers including Full Moon, Belgian white ale and the Up River lager. Also serves pizzas and pub food. There is a Best Western set off the main road in Lake Havasu. This is on the opposite side of the road to the lake. It has a swimming pool in the middle court yard and secure boat parking. There are also several hotels round the London Bridge area of Lake Havasu and some smaller bed and breakfasts. 34.47063-114.3480111 Heat Hotel, 1420 N McCulloch Blvd, ☎ +1 928-854-2833, toll-free: +1 888-898-4328, e-mail: team@heathotel.com. Very modern hotel right next to London Bridge with funky rooms with Bridge views. The lively bar (which is also the reception area) with a large outdoor drinking area with bridge views are clearly audible in rooms, so it's not a hotel for those who want a quiet early night! 34.471258-114.3455382 London Bridge Resort, 1477 Queens Bay Lake (on the water and at the base of the London Bridge, 20 minutes from Havasu City Airport), ☎ +1 928-855-0888, toll-free: +1 866-331-9231, fax: +1 928-855-5404. Check-in: 4PM, check-out: 11AM. On 110 beautiful waterfront acres. This city travel guide to Lake Havasu City is an outline and needs more content. It has a template, but there is not enough information present. Please plunge forward and help it grow! This travel guide page was last edited at 07:06, on 20 February 2019 by Wikivoyage user Ground Zero. Based on work by Wikivoyage users Traveler100bot, Andrewssi2, JakeOregon, AndreCarrotflower, Traveler100, AndreeBot, Wrh2Bot, Wrh2 and StellarD and others.